John Hollenbeck's Claudia Quintet occupies an odd space in the topography of the contemporary jazz scene. There's a certain family resemblance to groups mining the post-Steve Coleman math-jazz vein, except that with Claudia, many of their most disorienting rhythmic contusions and collisions are layered over a simple 4/4 or 3/4 grid. John's music is complex, but he doesn't bludgeon you senseless with unrelenting density and abrasiveness. His long through-composed forms build up and draw down in elegant proportions, and new ideas are presented and transformed at a natural and satisfying pace. The music isn't driven by melody the way, say, Maria Schneider's music is, but it's still infused with an approachable melodic sensibility. The group find almost limitless coloristic possibilities in the combination of their five individual voices. This, along with John's entwinement with the Downtown new music scene (Meredith Monk, the Bang on a Can People's Commissioning Fund, etc.) have led some critics to call the Claudia Quintet a modern-day successor to the "chamber jazz" and "third stream" groups of the 1950's. To me, though, those terms imply a sound that's pretty far removed from Claudia's catchy hooks and trancelike grooves. John handles the tension between dissonance and consonance, density and transparency, structure and freedom, darkness and light, repetition and transformation, etc., better than just about anyone else writing small-group jazz right now. I think this is because he really gets that these concepts aren't mere abstractions -- they are all deeply emotionally meaningful, and anyone who wants their music to actually communicate needs to learn how to blend them effectively. This may all seem painfully obvious, but much of the new music I hear -- jazz and otherwise -- seems willfully oblivious (if not downright hostile) to having an emotionally meaningful structure. That's why it's such a joy to hear a group like Claudia play stuff that's intellectual and innovative and conceptually strong, and yet actually tells a coherent story and is fun to listen to. Their set last night at The Stone was mostly material drawn from the new release, For, which I'd not previously heard. (I picked up a copy at the gig, and am listening to it now.) It's all pretty compelling, but the standout for me is "This Too Shall Pass," with Ted Reichman's cumulative accordion clusters melting into Matt Moran's ghostly bowed vibes, sustained over a simple half-note descending bass line courtesy of Drew Gress. The ensuing clarinet-and-accordion melody is simply heartrending. This was followed, as on the record, by "Rug Boy," the freest tune in the Claudia book. The opening drum solo sets up a surging, fast rubato five-way dialog, until Chris Speed joins Ted on the written melody. It concludes with a five-chord progression, each one softer than the last. 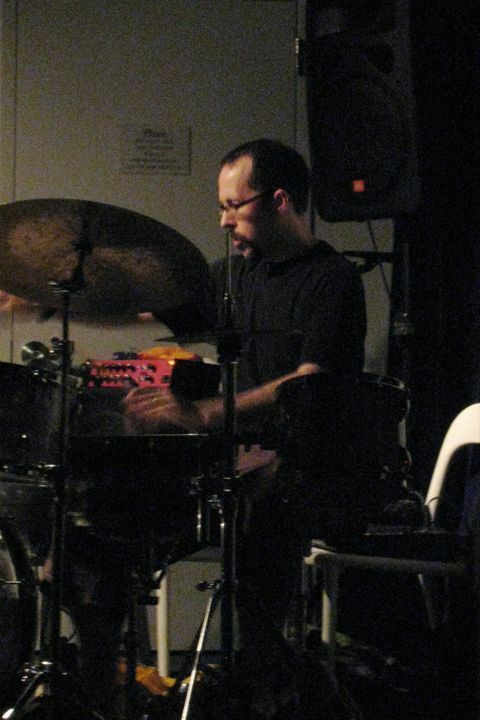 In his Max Roach memorial post, Ethan Iverson talks about Max having a bit of an "icy" beat, one with "fearsome clarity and control" -- in contrast to Kenny Clark's "warm glow." I think this is a useful frame -- jazz musicians will often talk about drummers with a "wide" beat (Klook, Elvin) versus drummers with a "narrow" beat (Max, Tony). John Hollenbeck definitely falls in the latter category. His playing is incredibly tight and precise, which makes it even more amazing that the group never sounds stiff or mannered, even when navigating the most fiendishly difficult passages. John isn't just the composer-bandleader, he's the rhythmic and dynamic center of the band, which gives everyone else the freedom to be fluid and expressive, knowing that when they need him, Hollenbeck is back there holding down the fort. 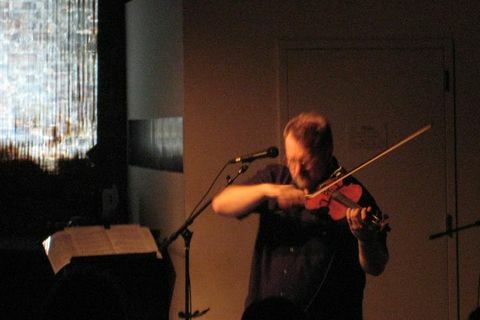 Todd Reynolds is revered by violinists and electronic music artists alike for his formidable chops in both fields., but what I like best is that everything he does is grounded in genuine earthiness. The whole "play, sample, loop, and hold" routine is well-worn by now, but Todd never sounds like he's just dicking around with loops and beats -- his layered creations are always succinct and satisfying, often evolving and grinding against each other in unexpected ways. Luke Dubois was on hand, manipulating the live video, which looked extra-cool projected against the exposed brick of The Stone's back wall. After a few solo tunes, Todd was joined by longtime collaborator (though he's new to me) Michael Lowenstern on bass clarinet for a couple of duets. The first of these was built up from a percussive, slaptongued bluesy bass line, and the second led unexpectedly into an artfully deconstructed version of "Summertime." Todd's next guest turned out to be the charismatic Czech violinist/singer Iva Bittová, and then both she and Lowenstern joined in on the closer, a brand-new (as in, "written the night before") stomping, folksy romp. This pairing wasn't mere happenstance -- John Hollenbeck is writing a new piece for Todd Reynolds and Claudia Quintet vibraphonist Matt Moran. Clearly, this is something I'm very much looking forward to hearing.